Ok Fans, it looks like I am getting back on schedule. I hope you enjoy this little story. As my job has allowed me to travel a lot, I really miss my sunshine. Although I fly most of the time, I have been known to drive to the work city. Well, I can't ask sunshine to do the same, and short flights are just not worth the money anymore. (Or the time) So we take the train. 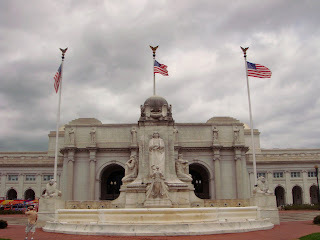 From DC, you have Union Station. Union Station opened in 1907. When the three major railroads operated in the area had their own stations. It is a great place to visit while you are in DC. Now there are several passenger trains serviced through there and many bus companies as well. Outside Union Station there is a replica of the Liberty Bell. I did not know that until I saw it myself. 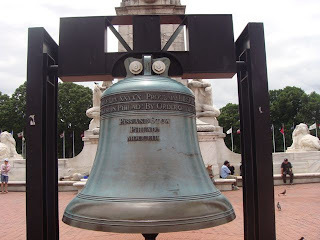 I have been to see the Liberty Bell in Philadelphia (with Sunshine) and that was really great. On a side note, I was watching Sentinel the movie, yesterday after work. There were several scenes from different places in washington. 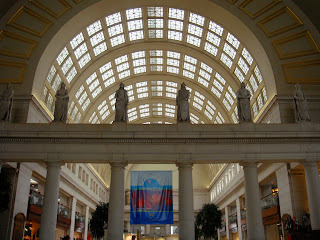 Things have changed since they made that movie, but inside union station was close to the same. A truly historic site that is a great visit even if for only a few minutes while you are in town. esp liked the rome post, i want to visit some day. Here we are at the end of the challenge and I have just discovered you! Now I will have the pleasure of reading your previous blogs for the challenge. Travel is my thing.